Earlier cooling. Enhanced performance. Get ahead with a trick. Normal thermoregulation during athletic activity follows defined rules: When the body temperature during activity climbs over a certain point, sensors in the back notify the brain via the spinal cord of the need for cooling. Only then is sweat produced to cool the already overheated body. How can we prevent the body from overheating in the first place? With athletic activity, the body temperature climbs steadily. Only when the upward curve reaches the zone of overheating does the body start to counteract it. First, though, since the begin of sweat production has been delayed, it must work to lower high temperatures. Cooling off takes longer; vital energy reserves are lost. The body stays in its optimal performance zone because sweat production kicks in earlier thanks to THE TRICK®. The early onset of cooling quickly and effectively decreases the already low body temperature. Athletes protect their energy reserves and can call up higher performance. Special structures on the spine trick the heat receptors and start to cool the body through perspiration much earlier. Sweat is transported directly to heat-intensive muscle areas where it evaporates for an optimal cooling effect. X-BIONIC® THE TRICK® has been rewarded internationally for: degree of innovation, outstanding design quality, choice of materials, workmanship, functionality and ergonomics. THE TRICK® with all its technologies allows you to tap into the valuable 97% of your energy reserves by supporting your body with maintaining its ideal body temperature of 37ºC. The intelligently designed surface structures of X-BIONIC® Partialkompression® allow the blood to aid in temperature regulation and ensure the optimum autonomic temperature. 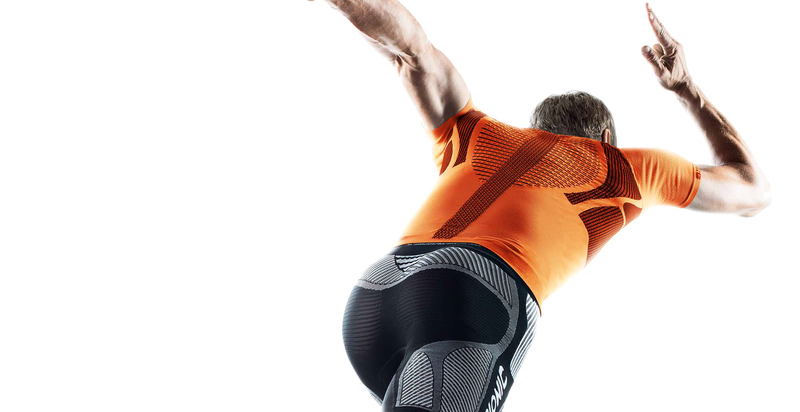 THE TRICK® unloads your body and, thus, can free up enormous reserves of additional energy for your performance. THE TRICK® switches your body to cooling mode earlier. Your performance improves from the start. The brain interprets the signals as a sign that the entire body is overheating and kicks in sweat production. Spine Insulation Zone creates a localised zone of warmth. Sensors register a strong warming trend. The problem: normal thermoregulation during athletic activity follows defined rules: when the body temperature during activity climbs over a certain point, sensors in the back notify the brain via the spinal cord of the need for cooling. Only then is sweat produced to cool the already overheated body. The solution: with THE TRICK®, the developers at X-BIONIC® have found a new and superior way to thermoregulate. Along an insulation zone on the spine, an overheating of the body is simulated, and the brain kicks in with early sweat production. Even before the body overheats, it’s cooled by sweat effectively and more quickly. The strain on physical systems is relieved. The strain on physical systems is relieved. Special woven structures placed along the spine simulate the entire body warming up. In addition, it creates a localised zone of warmth where the body temperature climbs distinctly higher than on the rest of the body. Within the warm zone, they register a strong warming trend. The sensors transmit their observation along the spinal cord to the brain. The brain interprets the signals as a sign that the entire body is overheating. It kicks in sweat production although the body in fact is still near its optimal performance temperature. Extreme cold. Excruciating heat. Make room for the perfect performance climate in the middle. The 3D Bionic Sphere® System with ThermoSyphon® Technology on the back is split in two and wraps around both sides of THE TRICK®. Thanks to the ThermoSyphon® 3D Bionic Sphere® System, warmth that comes from the insulating function of THE TRICK® is cooled down as soon as sweat production begins. Overheating is effectively counteracted.